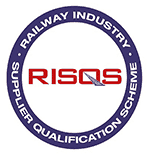 Provide long-term modular accommodation comprising of a state of the art teaching facility. break out study area, complete with full suite of w/c amenities. Perhaps the most challenging aspect of this project was the size constraints of the site. Every aspect of the modular building’s design was examined to maximise the useable space. As one would expect from a modern university amenity the fit out was technologically intensive. Working with a detailed performance specification several hi-tech sub-contractors were used to provide the very latest in ICT and BMS systems including: Smart Lighting, Linked and remotely monitored heating systems, remote access control. 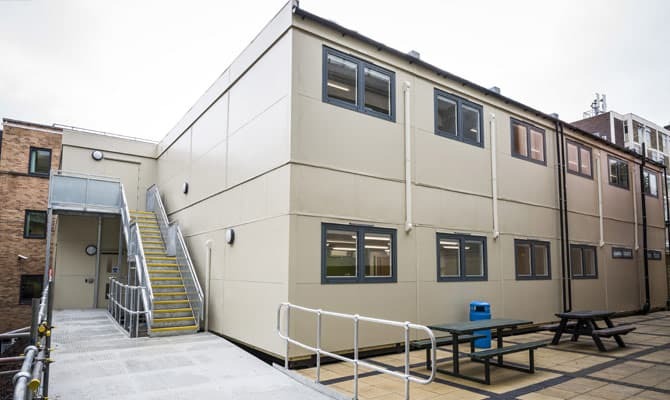 The close working relationship between Kier and Portable Building specialist SiBCAS, paid dividends and resulted in a first rate modern modular teaching facility. 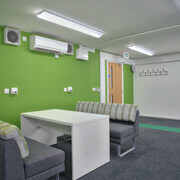 Needless to say the client and modular building users are delighted with the facility. Despite operational challenges the project was delivered within the exacting programme with negligible snagging. 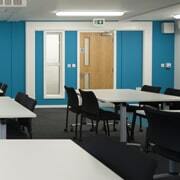 SiBCAS Case Study: Long-term Modular Accommodation, Sheffield Hallam University. Newcastle Royal Grammar School Blackmoor Park Infant School.